A funny thing is happening today inside the walls of corporate offices across America – nothing. It wasn’t too long ago that enterprises wouldn’t dare consider allowing their employees to work offsite – not only because of a long-held belief that on-site team collaboration was absolutely essential to the corporate dynamic, but because, it was thought, there is no possible way that employees would be more productive working from their home. But today’s transforming workplace includes a major shift from the cubicle culture to the telecommuter, abetted by improving collaboration technologies and better ways to measure individual results and outputs. In fact, more than 25 percent of the white-collar workforce is working “anywhere but here,” according to the U.S. Bureau of Labor Statistics. That is nearly double the number of remote workers reported in 2004. For the companies that have adopted remote work strategies, many are discovering that profitability is actually increasing due to less on-site care and feeding, less time stuck in traffic, fewer office politics and interruptions to get in the way. Stop wasting valuable dollars and send out this survey to your employees to see what perks they desire most whether it’s working remotely or other workplace benefits. You no longer have to limit yourself by looking for talent in one locality, when you could be searching globally for the best remote workers. 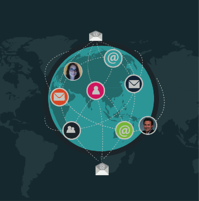 Millions of companies have already discovered the many benefits of hiring a remote workforce. There are opportunities for contractors and even employees to find reliable, fulfilling employment, a market that increases each day. For mid-sized companies – such as those who engage fractional Chief Marketing Officers through Chief Outsiders – they are finding that remote employment is a great way to get a right-sized dose of C-level insights, leadership and support – right now. When I’m in a remote engagement, I too practice what I preach -- leveraging a team of remote workers from all over the world who help on specific projects. I work with my team on group projects with tools such as Dropbox and Google Sheets, which allow multiple people to work on the same project at once. The first image for this blog was produced on Fivver.com, however the image did not match the description that was proposed. The description was to show a cartoon image of Danielle working remotely from her home behind two monitors, to display freelancers in other countries, and to showcase myself commuting in a car into the city. 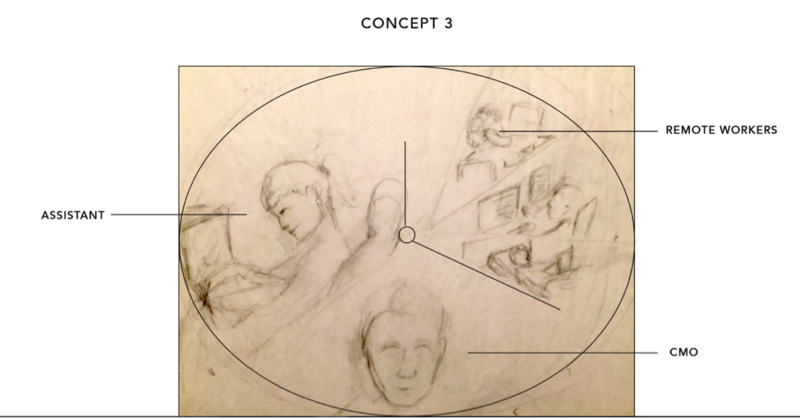 Our pictures were submitted to the designer and as stated, the intent of the image was to display how we are all connected and work successfully together in different geographic areas. This image costed $5 on fivver.com. Here is the first image draft. 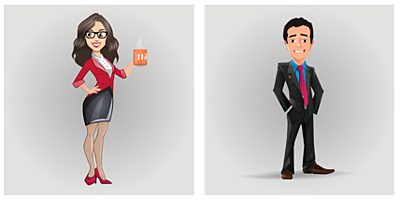 The last designer could not create cartoon images off-the-bat so, Danielle used a different freelancer on fiverr.com who specialized in cartoon images to create two characters that could be inserted into the desired graphic design image. This cost was $21. Here is the result. With these characters, Danielle outsourced to a local graphic designer to create this image for $25. This is the 2nd attempt to complete our desired image. Web design has to do with many different types of graphics and images and it’s important to get clear on what type of designer you are looking for and what is the price you are willing to pay. Otherwise, like as Danielle experienced, you may be disappointed with lackluster results. For example, there are commercial designers who are responsible for business cards, flyers, brochures or there are illustrators that draw out your creative idea from scratch. If you are able to draw out an image, you may outsource this to fiverr.com so they know exactly what they need to create. Warning: you must be very detailed in your description when outsourcing to fivver.com and even when you do you may find the result to be completely different than described or not up to the quality level you are seeking. Therefore, you may want to seek other designers on other platforms or ask for more revisions. For this specific image, I wanted a designer to focus more on illustrating concepts from start to fruition. Based off of my feedback, the illustrator created character profiles to review. 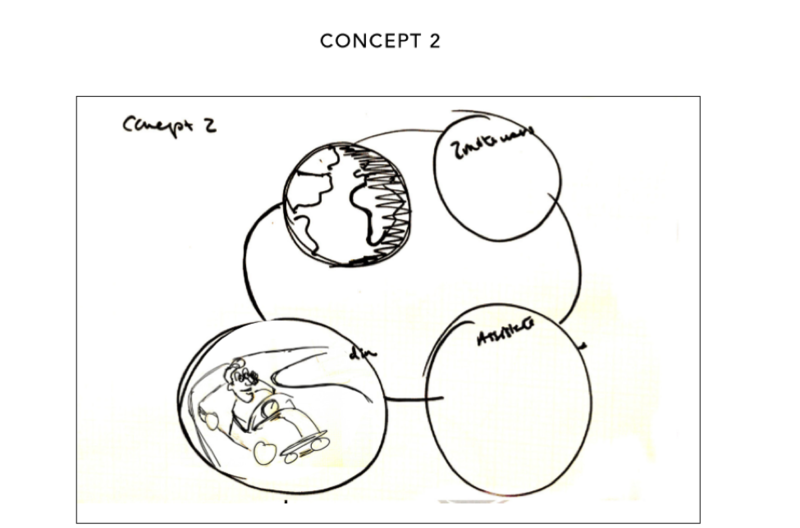 Next, the illustrator sent over 3 concepts. 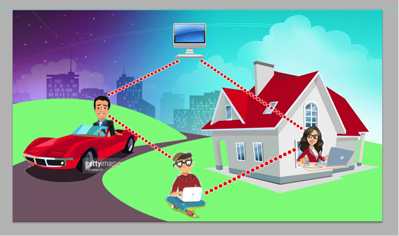 This image focuses on remote workers around the world which, you may see that this is the image selected with a few revisions inspired by Concept 2. 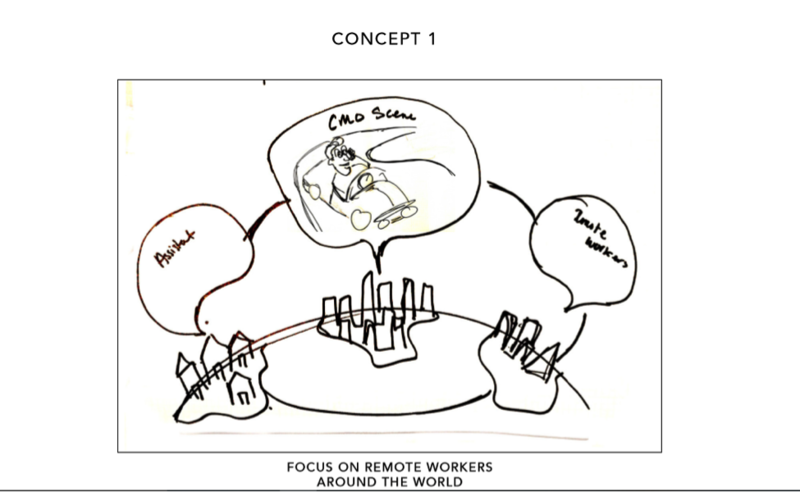 Concept 3 focuses on working around the ‘clock’ displaying CMO, assistant, and other remote workers around the world. Below is the draft before adding in all of the coloring. So once you decide on which type of remote designer you need whether it’s a graphic designer or an illustrator, you still have other decisions to be made and it’s important to get clear on what you need to focus on. In this case, I wanted to showcase that the time is right for remote work. 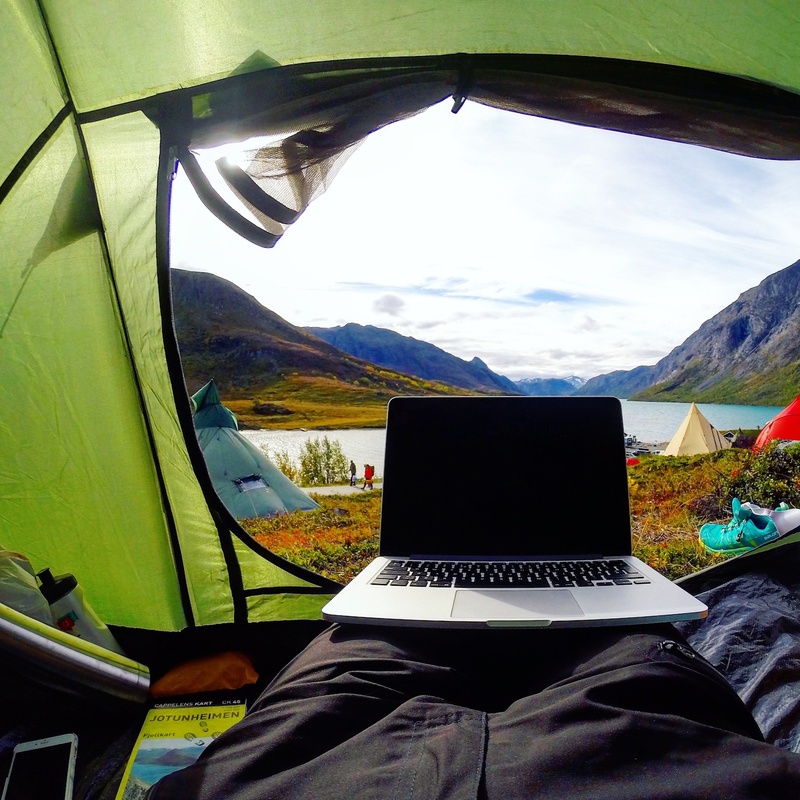 Why is the Time Is Right for Remote Work? Right now I am the CMO of two companies – a big healthcare organization and a company that helps businesses with organizational development—and I can assure you that I would not be able to split my time in this manner if I was tied to a single brick-and-mortar business location. Time is my most important asset. I must leverage every available hour that I can by working remotely. Also, my clients enjoy the advantage of not shouldering the expense of constant travel. While occasional face-to-face meetings will always be useful when establishing professional relationships, tools such as Skype, GoToMeeting.com and even just the telephone can be just as effective when communicating with established or potential clients. Also, I have a system that I use called MightyCall, which ensures I never miss a customer call, because I am able to forward calls to my various phone numbers or various team members including a marketing assistant —who also works remotely. There is a specific cost for not working remotely which, I will discuss next. I charge hundreds of dollars for some of my services – so when I sit in Seattle traffic for two hours a day, essentially I’m losing thousands of dollars a week that could be redeployed into building a remote team. Even when paying a more modest hourly rate, the potential return for an employer can be quite massive. Imagine employing a round-the-clock workforce of contractors – producing work 24 hours per day, 365 days per year. You’ve just tripled your potential output for a very modest increased investment. When you hire the right remote workforce – you can work even when you are sleeping! There are, of course, some disadvantages to having a remote workforce. One of the biggest issues is locating the right workers in the first place. You can conduct interviews over email, Skype and the telephone, just as you would with an in-office employee. However, once a project starts, a worker can essentially “disappear” – stop responding to calls and emails -- and leave an employer confused, and without recourse. Most on-site employees, for better or for worse, can typically be easily found. The point of most workers choosing to work remotely is flexibility so, it’s important to have some type of margin of freedom for your freelancer. Another challenge resides with companies that turn to remote workers thinking that it is the best way to find cheap labor. This is not true (although costs will most assuredly go down over time). If you simply hire the most inexpensive workers, you could be setting yourself up for disappointment. Pay your workers a respectable wage, and all parties can be happy with the relationship. If your pay is fair and you invest the time in locating the right people, you are likely to be thrilled with the results. One other note on the selection of remote workers – when interviewing them, be sure you have a clear picture of what they are passionate about. It can be impossible to motivate anyone who simply isn’t interested in your project. I like to schedule a one-on-one meeting to go through the Trello project management board and identify what projects the worker may be stuck on. From there I am able to help provide a solution whether it be to 1) eliminate a roadblock, or 2) reassign the work. Once you have located the “right” remote workers, communication is key. All of your communications, whether via text or email or phone or Skype, must be as clear as possible. For an example of how incomplete communication can lead to chaos, I recommend checking out the following “building blocks” game. Ensure all communications with your remote workforce are detailed – particularly those around the scope of the project and the expectations for what is considered a successful deliverable. Finally, remember that remote workers are motivated by successful outcomes as well – and should be invited to enjoy celebrations, even virtually. Tools like Hipchat, Basecamp, Google Hangouts and Campfire are all means to work on projects together but also share those joyful moments across the miles.